General Paul Kagame has been assassinating the character of the Rwandan-born businessman Tribert Rujugiro Ayabatwa. Kagame claims that Ayabatwa is in cohorts with the Ugandan government in supporting the Rwandan National Congress (RNC) that seeks to overthrow Kagame. In an extensive interview in Uganda’s New Vision, Ayabatwa rejected the accusation. In the interview, he insists he was turned off Rwanda altogether back in 2009 — thanks to Kagame. Ayabatwa goes back into the history of his relationship with Kagame to illustrate why he rather concentrates on his businesses outside Rwanda. Ayabatwa begins his story from the early 1980s when he had to take care of Kagame’s mother and the rest of the Kagame family when Uganda’s President Milton Obote expelled Rwandan refugees. Then in the 1990–1994 period, Ayabatwa led other businessmen to raise a significant amount of money to support the struggle led by the Rwandan Patriotic Front (RPF). After the war from 1994 onwards, Ayabatwa became the leading Rwandan investor in Rwanda. For example, besides building the largest shopping mall in Rwanda, the US$20 million Union Trade Center (UTC), Ayabatwa invested in tea, shoe manufacturing, and real estate. Kagame would soon turn against almost all the people who supported the struggle including Ayabatwa. In 2013, Kagame seized UTC claiming that the mall was abandoned. Kagame soon revoked Ayabatwa’s citizenship even though Ayabatwa is a Rwandan by birth. 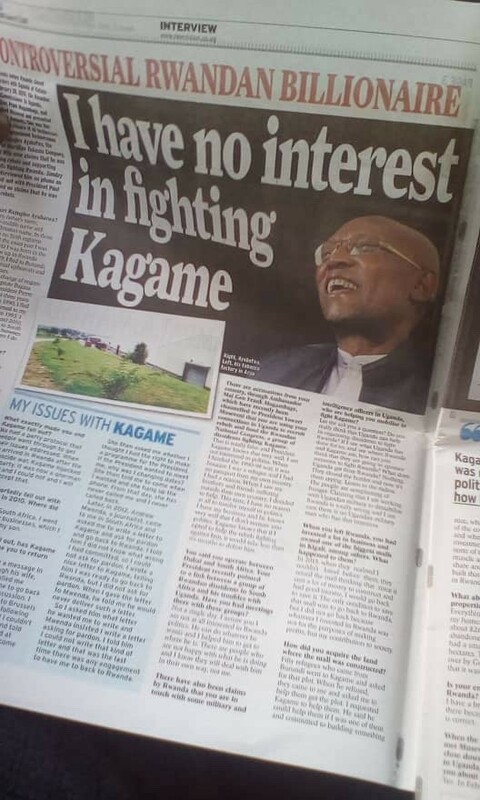 Ayabatwa concludes the New Visioninterview by insisting that he has nothing to do with Rwanda. A successful industrialist in 9 countries and trading across 24 countries, Ayabatwa would rather concentrate on his businesses than engage with Rwandan politicians of any kind.